The exhibition is devoted to the Mrągowo region, from ancient times to early Middle Ages. The artefacts gathered there present various stages in the socio-economic development of the population living in these areas. The first traces of human groups in the Masuria Lake District belt appeared in the period of about 10 thousand years BC. The oldest artefact found in the vicinity of Mrągowo is an ornamented arrowhead made from the horn of an elk from the area of the lake near Piecki (about 10 thousand years BC). Most findings come from the Middle Stone Age (about 8 thousand years BC). This was probably related to the warming of the climate, and thus with more favourable living conditions. With the spread of forests, hunts for animals living in herds had to wane. The area of Mrągowo was penetrated by trappers and hunters at that time. A remnant of their presence are the tools made of reindeer antlers, horns of aurochs, elk, bear bones, stone and flint (i.a. a harpoon from Wojnowo, a horn hatchet from the River Krutynia). Around 4 thousand years BC, people started to arrive to the area of Mrągowo and settled here permanently. They represent a new type of economy based on land cultivation and animal farming. Continuous progress in the manufacture and firing pottery follows. The appearance and spread of a new raw material – bronze – defined the next step in the development of human groups in the vicinity of Mrągowo. Hence this era is called the Bronze Age (about 1 700 years BC). First bronze products appeared. With time, the agricultural and animal farming economy strengthened and new habits in the spiritual realm became widespread. Cremation of the dead was a manifestation of the new beliefs. Skeletal remains burned at the stake were put into urns (e.g. the burial ground in Pustniki). Artefacts of that time from the vicinity of Mrągowo are i.a. 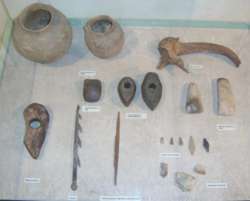 : a bronze pickaxe from Popielno by Lake Śniardwy, and bronze hatchets from Cierzpięty, Rybno and Woźnice. The number of points of settlement on the discussed area increases significantly from about the 5th century BC. The common feature of these settlements was a generally defensive positioning in inaccessible, hard-to-conquer places. Such sediments were found in the Maradki and Rybno localities. The most interesting discoveries include a settlement on water located by the shore of Lake Piłakno. Next to the defensive type of settlements in the area of Mrągowo, there are new forms of burial grounds. They are represented by artificially piled up mounds of earth called barrows. Inside their stone and earthen structure they housed urns, placed on a stone pavement. Such burial grounds have been found in Gieląd, Głodowo, Jędrychów, Warpuny. It was then that a new culture developed, called the West Baltic barrows culture (from about 500 BC to the early years of our era), which is a reflection of long-term settlement processes in the Baltic region. In the beginning of our era (the years from 0 to 400 AD) in the already uniform area of the Baltic culture there were further settlement and economic transformations. It was connected with the new ability to create tools out of iron. More efficient than the ones previously used, they allowed for the more intensive development of crafts and agriculture. A new social system was established. Social bonds formed between territorial communities, progenitors of tribes. From this period come the crematory burial grounds, with rich furnishings with items made of silver, iron, glass, amber. These were: brooches, pins, buckles, rings, necklaces, beads, spearheads, spurs and more. The burial grounds were discovered among others in Babięty, Mojtyny, Machary, Brejdyny, Dłużek, Gąsior, Koczek, Muntów, Zyzdrój. A characteristic feature of the Mrągowo burial grounds is the presence of bronze and silver coins from the 2nd and 3rd century AD. They were discovered in Koczek, Lasowiec, Machary, Mojtyny. A very interesting feature of the burial rites are burials of horses. This custom was used by the people living in the Baltic area. The horses were buried along with a beautiful and rich harness. They were discovered, among others, in Wólka Prusinowska and Kosewo. In the 5th century AD, the influence of the Roman Empire and its provinces started to wane, and imports from the Black Sea area started to appear in the Masuria Lake District. This is proven by archaeological materials from that time, found in the Mrągowo poviat. The Galind tribe inhabiting the area as early as the first centuries of our era had a crystallized agricultural-animal farming economy and developed social ties. A manifestation of intertribal fights were probably the newly established gords, including Szestno, New Bagienice, Majcz Mały, Młynik, Pustniki. The gords were generally defensive structures, additionally fortified with embankments and palisades. The gords were the headquarters of the contemporary representatives exercising authority over the nearest area. At the foot or near them, settlements for farmers, artisans, merchants emerged. Traces of the early Middle Sges settlement have been discovered in the following localities: Lipowo, Dłużec, Surmówka, Boże. Burial grounds from that period have been discovered in Brejdyny, Łuknajno.